A very shocking news occurred in Santa Maria, southern Brazil. Almost 3,000 people were inside the Kiss nightclub when the fire started. 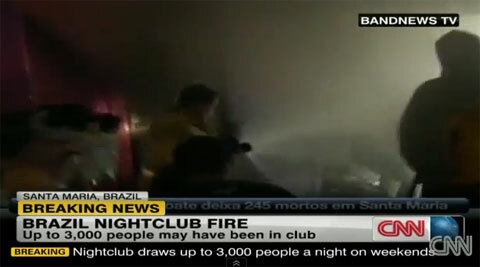 More than 230 die in Brazilian nightclub - most of them are students. According to report by The Daily Mail site, eyewitness of the incident said that the Security guards tried to stop people leaving through an exit door because they did not understand what was happening inside, and they wonder if those people had paid their drinks bills. But after 2 minutes they opened the doors after they realized what was happening. Murilo de Toledo Tiecher, 26-year-old medical student, told Zero Hora newspaper: "People were screaming "there's a fire" but the security guards didn't budge and tried to keep the door shut." While, Ezekiel Corte Real, 23-year-old, he managed to escape and helped people to come out. He said, "I just got out because I'm very strong," according to Zero Hora newspaper. Ingrid Goldani said the fire started when the band leader lit a flare for about 10 minutes into the stage then the fire came out on the roof of the stage. Dr. Paulo Afonso Beltrame said to AP through telephone, "Large amounts of toxic smoke quickly filled the room, and I would say that at least 90 percent of the victims died of asphyxiation." He added, "The toxic smoke made people lose their sense of direction so they were unable to find their way to the exit. At least 50 bodies were found inside a bathroom. Apparently they confused the bathroom door with the exit door." Police official reportedly said the total number of victims, 120 were men and 110 were women. Comments or suggestions about "230 die in nightclub deadly fire in Brazil" is important to us, you may share it by using the comment box below.